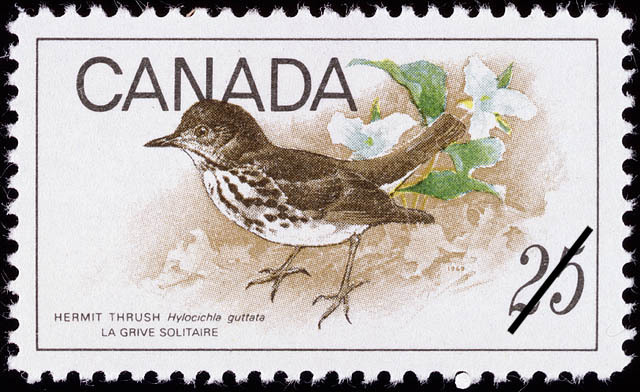 The value of a Hermit Thrush, Hylocichla guttata - 25 cents 1969 stamp depends on several factors such as quality and wear, supply and demand, rarity, finish and more. Values in the section are based on the market, trends, auctions and recognized books, publications and catalogs. This section also includes information on errors and varieties and characteristics. There is a little in the modest appearance and seclusive habits of the Hermit Thrush to suggest that it is actually one of the most talented musicians of the entire bird world. in the long summer twilight of the Canadian backwoods country, the Hermit's voice is at its best; the exquisite, bell-like notes have a strangely ethereal quality that has inspired many a poet. In spring and autumn migration the Hermit Thrush is usually silent except for an occasional soft chuck; it is a brown-backed thrush closely resembling several other species, but it can be distinguished by its reddish tail. It prefers wooded retreats and does much of its feeding on the ground; the menu consists mainly of insects and wild fruits. The nest is customarily placed on the ground; 3 or 4 greenish blue eggs are usually laid. The Hermit Thrush breeds from central Alaska eastward across the forested parts of Canada to Newfoundland and Nova Scotia, and south locally into northern United States.